Coming back to the Tembusu trees, you are probably carrying a picture of a famous Tembusu in your pocket. This tree in the Botanic Gardens is featured on the back of the $5 note. The front of this $5 note has a picture of President Yusof bin Ishak. Update: In Year 2002, there was a special stamp issue on “Heritage Trees”. 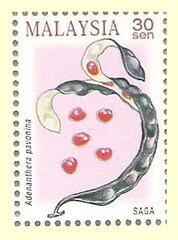 The Tembusu was in one of the 4 Heritage-tree stamps. Seriously, there is still some jungle here. If you take a stroll in the Botanic Gardens’ jungle, you can see tall trees, rattan, pandanus, etc. Also, if you have bought straw mats, handbags, baskets, etc from Malacca, Kuantan, etc., you may like to know these straws were cut from the leaves of the wild Pandanus, then bleached, coloured, and weaved. Just next to the “jungle”, down by the Symphony Lake where musical concerts are staged, you can see the Rubber memorial. This marks the spot where Henry Ridley planted the first rubber seedlings in Southeast Asia in 1877. Rubber became one of the engines of growth in Southeast Asia with the advent of motor cars and World War 1 and is still an important contributor to the economy today. In the Science Centre there is a big cylindrical plastic container with about 300,000 seeds at the moment (June 2000). The target is to collect one million Saga seeds. When that is reached, children will be able to see concretely what ‘one million’ of something looks like. Incidentally, if you are collecting the bright red Saga seeds for your children, the tree at the corner of Block A and Oei Tiong Ham Building has a lot of seeds at the moment. There is another Saga tree behind the Security post near House 5. Is the well-known Malaysian car known as the Proton Saga named after the Saga seed? Sorry, I don’t know the answer to that question, do you? If you look up at the trees on Bukit Timah campus, you will notice that one type has lots of little yellowish-white flowers. The tree is the Tembusu. In the Upper Quadrangle, outside Mannaseh-Meyer Block, there is a row of young Tembusu. On a quiet evening when the air is very still, you might get a whiff of its fragrance. In fact, its fragrance probably impressed the early botanists judging from its scientific name of ‘Fagraea fragans’. Another tree on campus that has ‘flowers with a smell’ (what an awkward way of getting around the not-so-neutral phrase ‘smelly flowers’) is the Clove Tree. This tree has recently become famous, or infamous, because of the book entitled ‘Kretek’. The clove is used in making the popular Indonesian cigarette known as Kretek. You can see a Clove Tree in the area between the Library and Federal Building, near the Mango Tree and Henna bush. I don’t find the smell of cloves fragrant even though its scientific name is ‘Eugenia aromatica’. Which nut is not a nut? Question: Which of these nuts is not a nut? Several people picked Coconut as the odd one out. The correct answer is ‘peanut’. A ‘real’ nut comes from the flower-then-fruit and is above ground whereas peanuts are underground (hence, its other name – groundnuts). One humorous colleague told me that the coconut is not a real nut because there is no nut(?) inside the coconut! By the way, if you want to see the biggest nut in the world (serious-lah, not joking! ), go over to the Botanic Gardens Office Block. Near it you will see the Coco-de-Mer or Double-Coconut palm tree. Take a good look at it and see if you agree with the description that the double-coconut looks like “a lady’s buttocks”. You know my dear friend from our Biology Department, the ever-courteous and gentlemanly Dr Shawn Lum. He puts it more delicately thus, “Some people say that the Coco-de-Mer resembles a part of a lady’s anatomy”. While it is more delicately phrased, I think it is even more suggestive! Incidentally, do you know we almost become NUT employees! Luckily, the powers-that-be decided to call us Nanyang Technological University (NTU) rather than Nanyang University of Technology (NUT). Imagine being called a NUT graduate/ lecturer when standing next to a NUS graduate/lecturer! One day Prof Gopinathan showed me some string-like dried fruit a friend had given him. He said the fruit was new to him. The common name of this fruit is Tamarind (also known as Asamin Malay). The taste is sourish. The fruit is used to make the sour-gravy base for mee-siam and Chinese rojak. I think it also goes into the kuah-asam in Malay food such as ‘Asam-curry fish’. You can buy the fruit in slabs in the wet market. The fruit is also used in drinks; a ‘Sour-plum and Tamarind’ canned drink costs 50-cents a can from the NTUC supermart. If you want to see some very good specimens of Tamarind trees, go to Peach Garden Road (off Meyer Road in Katong). Our Institute was housed in Bukit TimahCampus for many years, from 1983 to end-2000. 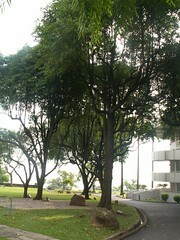 Environment-wise, one of the features of Bukit Timah Campus that impressed staff, students, and vistors was the number and variety of trees. Added to it was the fact that the campus was next door to the world-famous Singapore Botanic gardens with its great collection of native and exotic plants. As with many other blessings in life, there was a tendency to take the greenery and scenery around us for granted. newsletter about ‘anything and everything”that might be of interest to NIE Colleagues young and old. The NIE moved to JurongCampus in 2001. I continued writing Retrievia in Jurong campus but there was less mention of plant life. In response to a request from our nature-loving colleagues, here are the few excerpts from Retrievia about ‘Trees on Bukit Timah Campus’.